Can Electric Vehicles Spark Investment Opportunities? In Part One of our Two-Part Series, we discussed broad trends that are unfolding in the electric vehicle (EV) space. 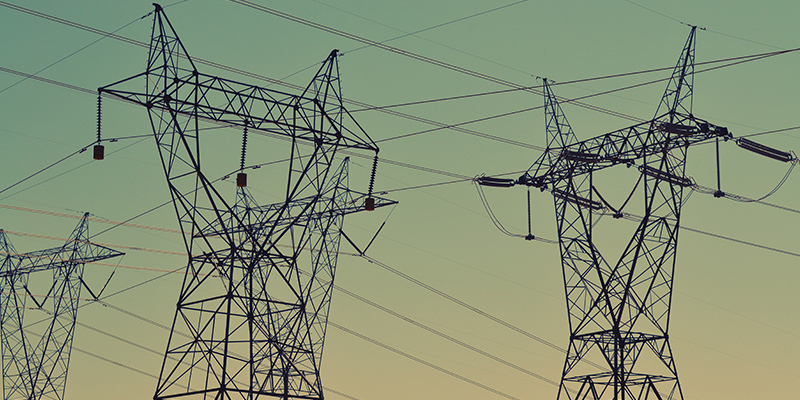 Today, we discuss investment implications from the rise in demand for EV-related commodities. In the wake of rising popularity of electrically-powered vehicles, there is a scramble among organizations to lock down supplies of commodities used in rechargeable batteries. Volkswagen, the world’s largest automaker, recently secured $25 billion in battery supplies to support its foray into the EV market. Shenzhen-listed GEM, one of the largest suppliers of EV battery materials across the globe, recently signed an agreement to obtain more than 55,000 tons of cobalt to meet its production targets. Apple executives are discussing buying long-term supplies of cobalt directly from miners to assure that the company has enough of the key battery component to support production efforts in the years ahead. Below, we explore the impact of the shift to EVs on some of the most critical commodities used in their production. Lithium is used in the lithium-ion batteries powering EVs and is one of the most important commodities linked to vehicle electrification. Even though EV volumes remain small, their rapid growth has already significantly impacted lithium demand. Worldwide lithium consumption has nearly doubled since 2011, causing prices for the commodity to rise sharply. While consumer electronics have historically been the largest source of demand for lithium, EV batteries require far greater amounts. So how the EV landscape unfolds will be a primary driver of lithium’s overall demand going forward. Companies operating in the lithium space have been expanding their existing production facilities to keep up with demand, but there is the potential that anticipation of an inflection point in EV demand may cause lithium to tip into oversupply if an overbuild occurs. We are closely tracking both supply and demand for lithium as the market continues to develop. Like lithium, cobalt is a critical component in EV batteries, and EVs are now the largest driver of overall cobalt demand. Unlike lithium, which is typically mined directly, cobalt is almost exclusively mined as a by-product of copper and nickel. Due to current supply constraints in copper and nickel, cobalt has also become supply constrained, pushing up prices. Almost all cobalt currently comes from the Democratic Republic of the Congo in Central Africa, a very unstable country where production is often under the shadow of slavery, child labor, and significant environmental degradation. These issues could prove meaningful in further constraining cobalt supply, as risks related to geopolitics, conflict, and power shortages are high in the country. Though these dynamics make cobalt attractive from a supply/demand perspective, they also make investing in the space challenging due to the associated geopolitical uncertainty. Now that cobalt prices have surged, there are increasing instances of substitution from cobalt to nickel. Though nickel is attractive from a supply/demand perspective, there are few companies with a primary focus on nickel production. We identified a diversified Russian mining company with meaningful nickel exposure that fundamentally looks interesting, but the associated macro/political risks are too high for us to recommend as an investment at this time. We do, however, have some exposure to nickel within our copper investments, given nickel is a by-product at some of the copper miners we currently own. So Where Are the EV-Related Opportunities? It is our view that finding opportunities in commodities that are primarily driven by EV growth currently proves difficult. There are very few companies focusing exclusively on the production of the metals used in EV batteries, and many of the ones that do have had sharp runs in their share prices, making it difficult to find an entry point. There are, however, areas of the market where we expect growing EV demand to incrementally support prices over a longer-term horizon, although EV growth is not the primary driver of the investment thesis in either instance. 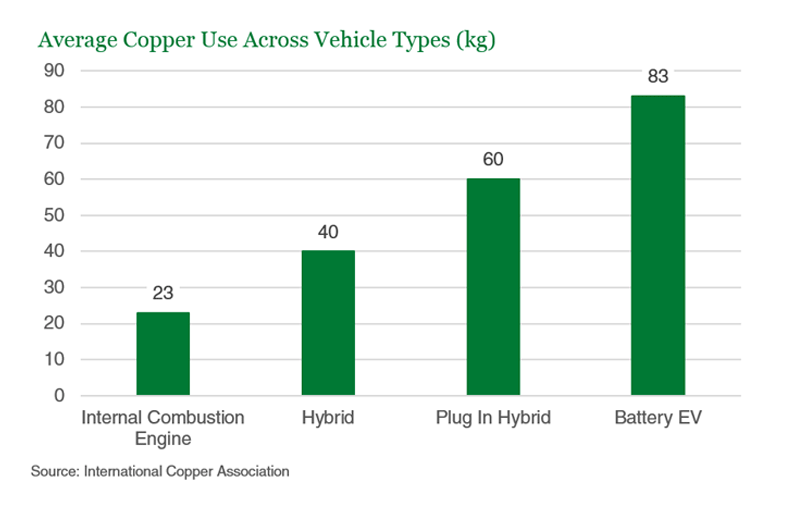 Copper is heavily used in EV production, at 3-4x the amount versus vehicles that utilize internal combustion engines (see accompanying chart). Copper is also used in the charging infrastructure that will be required to support ongoing EV growth. While our copper investments are not driven by EVs, projected EV growth does provide an additional incremental tailwind to the copper names that we hold in our portfolios. Other current portfolio investments where we have some exposure to EV-related metals include mining equipment companies, as they benefit from increased mining activity for materials used in EV production. These companies have strong competitive positions and some of the industry’s strongest service networks supporting a large installed base. The majority of sales come from aftermarket and service offerings, which provide pricing power and stability in margins and returns. These companies also exhibit stable profitability levels, strong free cash flow generation, and healthy balance sheets. As economies across the globe begin to turn their backs on traditional gas-powered vehicles in favor of EVs, the demand shift will likely have far reaching implications for automakers, energy markets, and other commodities such as lithium, cobalt, copper, and nickel. As a result of these shifting dynamics, it will be important to monitor demand for commodities tied to EVs in an effort to capitalize on investment opportunities as they present themselves.